Bay County Right to Life – Basic. Inalienable. The Right to Life. The annual Focus on Life dinner is scheduled for Thursday, October 3rd. Please mark your calendar now and let your friends and family know so they can join you. Click on the flyer for full details and a form to reserve your seats or table. We look forward to seeing you there! Join Us. Become a Member of Bay County Right to Life. Bay County Right to Life’s membership drive is going on right now. Please consider printing the membership form and mailing your membership in today. Or, you can click the donation button to submit your financial support online. Together we can put a stop to the evil of abortion. Thank you for joining us. We appreciate you! Do you knit or crochet? Would you like to help out your community without having to leave your home? 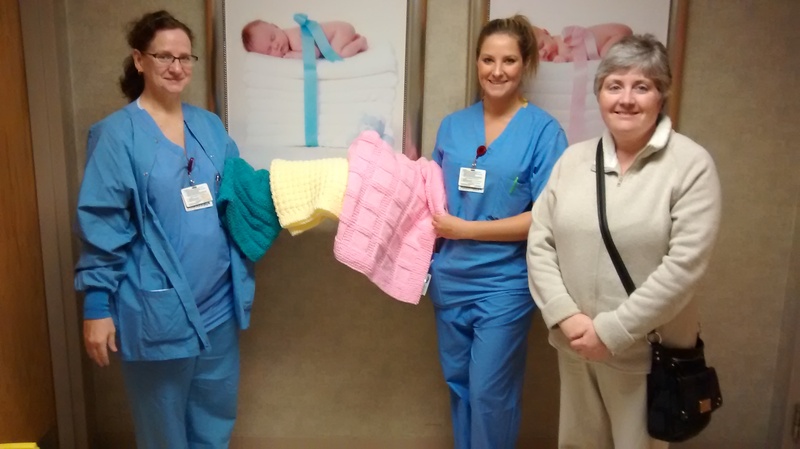 We collect newborn baby items (hats, sweaters, afghans, booties), and deliver them to McLaren Bay Region’s Birthing Center. Each little gift is tagged “With Love, Bay County Right to Life.” Imagine the powerful and affirming message this gives new parents and their families — for having chosen life. Baby-weight yarn donations are also welcome. To become involved or just get answers to any questions you might have, please contact Denise at 989-450-3366. Please accept our heartfelt Thank You to every individual who in any way helps in our ongoing Stitches of Love program. The following 4-minute video “Interview With An Unborn Child” is a powerful testimony to the most intimate thoughts and demolished dreams of the unborn child whose life is about to be taken from the safest place in the world for a baby to be: her mother’s womb. Your generous donations are used to do so much: provide educational materials in our community on abortion, infanticide, euthanasia, and assisted-suicide; sponsor pro-life speakers at the annual dinner; promote the confidential helpline 1-800-57-WOMAN; support bus trips to March for Life; support life projects in local schools and youth groups; and assist agencies that defend all of life. Your continuing support is so appreciated and makes possible the pro-life work of Bay County Right to Life. Click on the Donate button at the top of the page or from the Event, About, or Contact pages and thank you for your support of Life! We wrestle not with people or organizations but with an ideology that embraces a human life as ultimately worthless and expendable. We know the face of abortion is the innocent child, a living person with infinite worth. We appreciate you who stand with us! Bay County Right to Life is one of over 100 local Right to Life of Michigan affiliates representing thousands of Michigan citizens. We are a volunteer, non-profit organization composed of grassroots people of different political persuasions, various faiths, and diverse economic, social and ethnic backgrounds. We come together for one purpose, to restore legal protection to those members of our human family who are threatened by abortion, infanticide, assisted suicide or euthanasia. These are the issues we focus on and where your generous support is spent on defending human lives. Diverse though we are, we hold that EVERY human being has an inalienable right to life. We were formed in 1980 and have become the largest pro-life voice in the county. We are very active in the community, have a vibrant membership, and strive to proclaim the value of life from the moment of conception until natural death. Please consider joining us. Bay County Right to Life supports the efforts of all local crisis pregnancy centers including Bay County’s Beacon of Hope Pregnancy Care Center. Assistance may also be obtained by calling the statewide hotline: 1-800-57-WOMAN. We have an active email network and Facebook page. For more information, please join either one or both. We must never be silent.